While I am still working on the pieced fourth border for Scrappy Star, starting to work with these pieces in earnest is what’s beckoning although it is still quite a ways off. 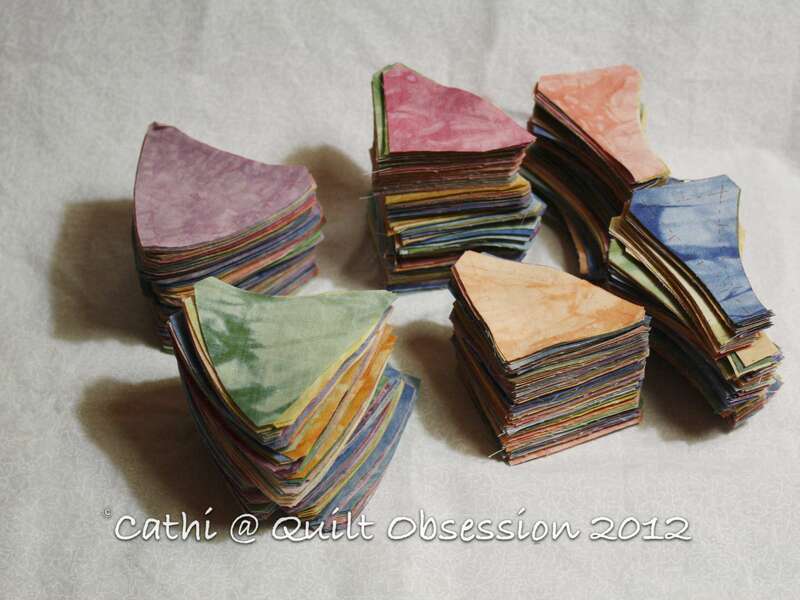 I finally finished cutting all the Winding Ways pieces last week. 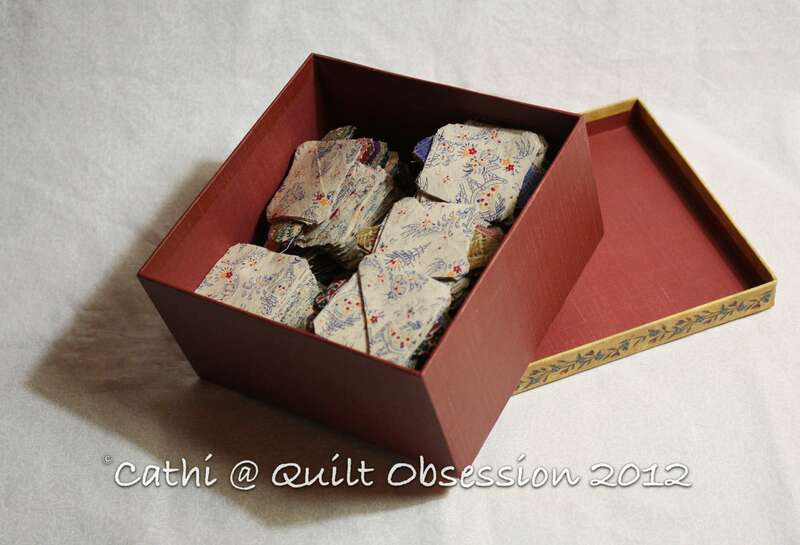 They are now nestled in their own box, just waiting until I can devote some serious stitching time to them. But before that happens I have to not only finish the pieced fourth border for Scrappy Star but also the final pieced fifth and possibly sixth borders for it. 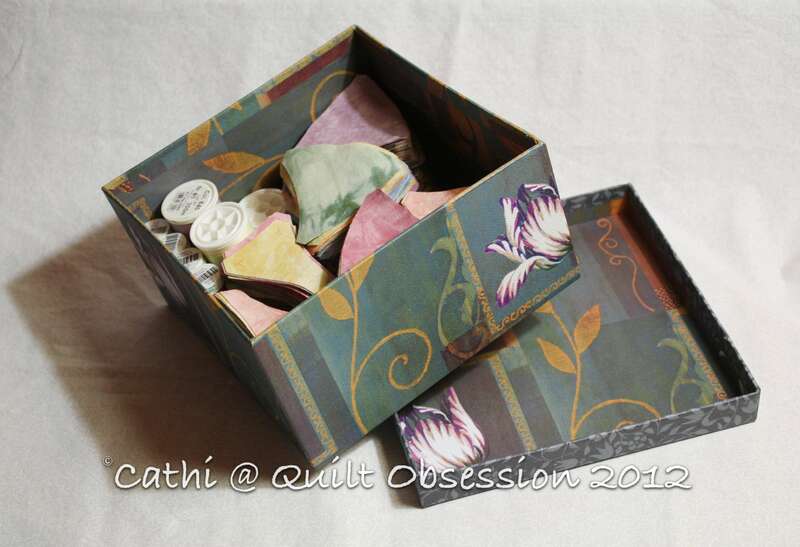 The pieces in this box will be incorporated into those pieced final border(s) for Scrappy Star. Then there’s the red and white Sunflower/Feathered Star quilt top that is next up on the list to finish as soon as Scrappy Star is done. After Scrappy Star and the Sunflower/Feathered Star tops are done, the Winding Ways blocks are going to be such a wonderful fun stitch. Some interesting comments yesterday on the topic of pre-washing fabric. It seems like almost all those who left a comment have the same feeling; that it’s the dirt and chemicals that are the bigger concern than the possibility of bleeding. Mr. Q.O. and Baxter have a game they play. Mr. Q.O. 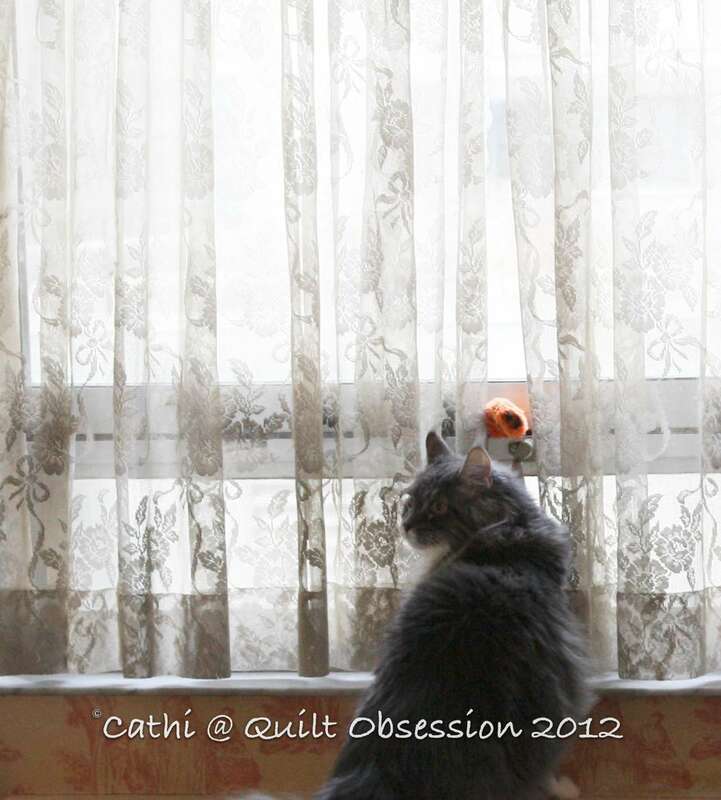 tosses Cappy, Baxter’s favourite toy, on to the windowsill. Baxter races over to grab it and then jumps back on the bed with it in his mouth. But yesterday? Yesterday, on one of the tosses, Cappy landed on the edge of the open window. Baxter apparently sat there for quite some time trying to decide if he’d grab it or not. Finally, he walked away. We rescued Cappy and all was well. You are very organised! Baxter is one funny cat – no doubt about it. Love your system of putting the pieces in the boxes. Very organized! Too funny with Baxter. Our kitties also play fetch. Such lovely fabric colors await you…like standing in an ice cream store gazing at the endless offerings! You are so organized…if I was to envy…your quilt room would be my aim! I’m delighted instead, that someone has things so organized and doesn’t deal with the hunt/search each time they sit down to a project! Oh that charming Baxter…but more so…the fact you have a window open in February! That is a good sign…spring must be coming!!! Hugs and happy stitching! Love the neat piles of fabric pieces! And thank goodness Baxter decided that discretion was the better part of valour! You are my idol…when I grow up I want to be as organized as you! !